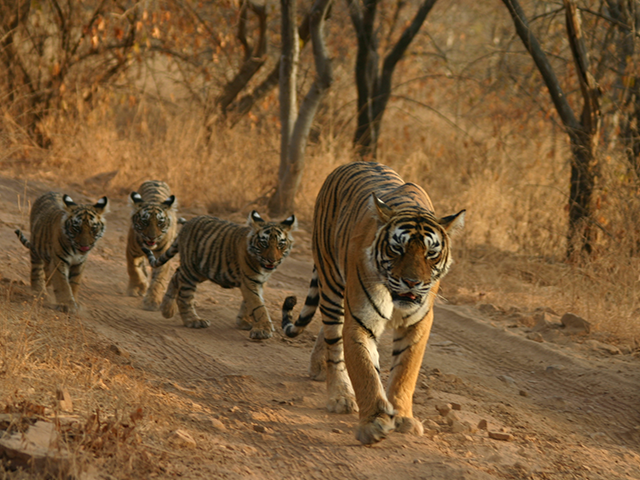 Set out on the trail of India's jungle royalty on this 15-day wildlife holiday! Explore Kanha and Pench, the scenic realms of the majestic Tiger, and Gir National Park, where the regal Asiatic Lions reign supreme! Your Indian wildlife tour begins on arrival at Mumbai Airport where you will be welcomed by our representative and transferred to your hotel. Mumbai, the financial capital of India, formerly known as Bombay, is a city pulsing with life. Cosmopolitan in nature, the city is steeped in culture and history. The city of dreams is a magnet to people from every walk of life, artists, actors, writers, businessmen, travellers, and anyone with a zest for life. The city has two UNESCO World Heritage Sites, The Chatrapati Shivaji Terminus and Elephanta Caves. A busy port city, it has many famous beachspots like Nariman Point, Juhu Beach Chowpatti, also Asia’s largest water Theme Park, Water Kingdom is located here. Explore the city or just relax in the hotel. We advise you to get adequate rest today, as tomorrow marks the beginning of an exciting journey into India's wilderness. Today we leave early in the morning for the airport to board a flight to Bhavnagar. We will be received upon arrival and driven 64 kilometers to Blackbuck National Park (approx 1.5 hours drive). 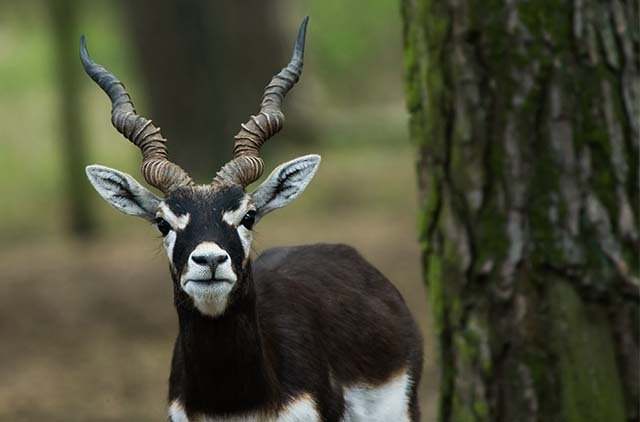 Blackbuck National Park also known as Velavadar National Park is located in the Indian state of Gujarat. It is famous for its population of Blackbucks, a majestic antelope species that is endemic to India. The park has a savannah type of vegetation alongside thorn shrubs. It is inhabited by several mammal species like Wolves, Foxes, Jackals, Jungle Cats and smaller species like Wild Pigs, Hares and Rodents. The park has a sizeable bird population and is home to Sandgrouse, Lark, Harrier, and several other migratory species like Lesser Florican, Eagles, Waders and many other birds which arrive in winter. We go on an afternoon game drive into the park. Later, we check in to the lodge and relax after dinner. Our day begins with a game drive into Black buck/Velavadar National Park. We plan to spend the entire day at the park. We go on a game drive on the narrow approach road that cuts across the park to explore the wilderness of Blackbuck National Park. In the evening, we will return to our hotel in Bhavnagar. Velavadar is also an excellent birdwatching area. Here you might spot a variety of endangered birds like the Houbara Bustard, Lesser Florican, Common Crane and Sarus White Stork. Today after breakfast, we head for our next wildlife destination- Gir National Park (approx 4.5 hours drive). We aim to arrive at Gir in time for lunch. This will be followed by a game drive into the park’s wilderness until dusk. The 1,412 square kilometers Gir National Park and Wildlife Sanctuary (also known as Sasan-Gir) is the only habitat of the distinctive Asiatic Lion. It is also home to a thriving population of Panthers. The other animals spotted here include the Sambar, Chital (spotted deer), Nilgai (Blue Bull Antelope) and Wild Boar. The Chousingha, the world’s only Four-horned Antelope and the Chinkara, an Indian Gazelle, can be spotted in Gir as well. Our exploration of Gir continues over the next few days. 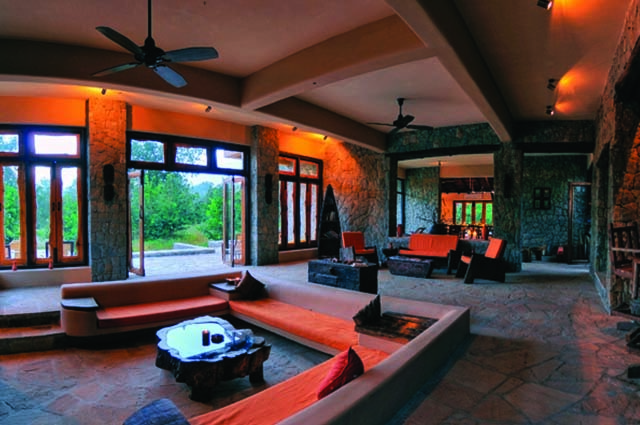 They begin with early morning safaris and we return to the lodge for breakfast. You can relax until after lunch, when we will set out once again into the park’s wilderness. The dry deciduous forest is home to several small animals, though there are a lot of water sources inside the park which attract a lot of birds. There are seven major perennial rivers in the region Hiran, Shetrunji, Datardi, Shingoda, Machhundri, Godavari and Raval. And four reservoirs, including the Kamleshwar Dam, which is called the ‘lifeline of Gir’. You will notice that Gir is one of the few places where humans co-exist with the wild. The Maldhari cattle herders have several villages inside the park and approximately 20,000 livestock graze the grasslands. After breakfast, we drive to Rajkot airport to board a flight for Mumbai. You will be welcomed by our representative upon arrival at Mumbai airport, who will help you get to your hotel. 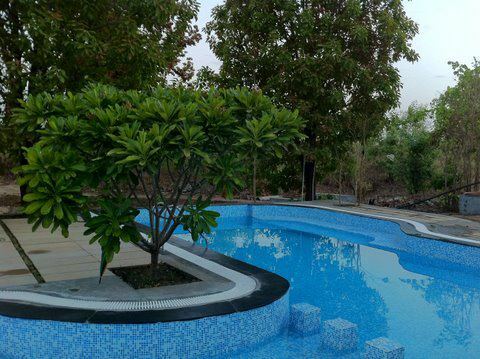 You are free to spend the evening relaxing or exploring the commercial capital of India. Today, we take an early morning flight to Nagpur. From Nagpur, we drive for about 6 hours to reach Kanha National Park by early afternoon. After lunch, we will set out on our first game drive into the park. Kanha National Park is a beautiful reserve that is rich in wildlife. It encompasses lush meadows, thick forests and water bodies. As you enter, the subtle fragrance of the Sal forest and the incessant sound of Cicada will captivate you. Kanha is home to the rare hard ground Barasingha or Swamp Deer. You might also see Spotted Deer, Sambar Deer, Langurs, Leopards and Dholes (Wild Dogs). A lot of smaller mammals like Foxes, Hyenas, Jungle Cats, Civets, Porcupines, Ratels or Honey Badgers and Hares are found in the park. The park has a lot of reptiles and snakes including Python, Cobra, Krait, Rat Snake, Viper, Keelback and even a few species of turtles and amphibians. The bird life is Kanha is diverse and the vegetation of the forest allows for some brilliant sightings. The commonly sighted birds in Kanha are Black Ibis, Cattle Egret, Blossom Headed Parakeet, Pond Heron, Common Teal, Crested Serpent Eagle, Grey Hornbill, Indian Roller and many more. After an eventful game drive we get back to the hotel and get a good night’s rest. Our exploration of Kanha National Park will continue over the next two days. Both days begin with early morning safaris and picnic breakfasts. We return to the lodge for lunch. In the afternoon, we will head into the wilderness of Kanha once more until dusk. The dry forest offers good sightings of mammals and birds, and if luck favors even the Tiger! Photographers get innumerable opportunities to shoot some great photographs. If there is time, we will drive to Bahmni Dadar – the highest point in Kanha. It offers a panoramic view of the entire national park. Today, after a short morning game drive, we bid farewell to Kanha and travel to Pench National Park. This is a drive of approximately 5 hours and we will try to reach in time for lunch. After lunch, we set out on our first game drive into the park’s wilderness. The beautiful Pench Tiger Reserve is nestled in the southern part of the Satpura Hills in the Indian state of Madhya Pradesh. It is named after the Pench River that flows through it. The apex predator of this forest is the Tiger. Apart from it the park is inhabited by other carnivores like Leopard, Dhole, Jungle Cat, Indian Civet, Wolf, Striped Hyena, Slothe Bear, Jackal and Common Palm Civet. The park is home to herbivores like Chital (Spotted Deer), Sambar, Gaur (Indian Bison), Nilgai, Wild Pig, Barking Deer and Chowsingha. These ungulates are found all over the reserve, except there might be local migration due to the water availability in different seasons. Common Langur and Rhesus Macaque are the primates found here. There are smaller mammals like Indian Porcupine, Common and Ruddy Mongoose and Black-naped Hare which also reside in the park. We head back to the lodge after the game drive and settle for the day after dinner. An early morning safari with picnic breakfast marks the start of this full day in Pench. The forest in Pench is of deciduous type, with teak being the predominant species. There are green pastures in the forests with bamboo groves in between. Pench is also a birding destination and some of the common birds sighted are Barbets, Minivets, Orioles, Wagtails and Indian Rollers. It is also a winter migratory home to birds and ducks. Some of the other birds are Crested Serpent Eagle, Painted Francolin, Changeable Hawk Eagle, Malabar Pied Hornbill, Collared Scops Owl and other species like White-eyed Buzzard, Mottled Wood Owl, and Jungle Owlet. Photographers will have excellent opportunity of taking great shots of the birds and beautiful landscapes. We return to the lodge for lunch, after which we go on an afternoon game drive until dusk. Today we may go boating for about an hour on the Pench river and return to the lodge by early afternoon for lunch. We then head for Nagpur airport to board a flight back to Mumbai. En-route to the airport, we might make a brief stop at the picturesque ruins of the Vakataka dynasty, which dates back to the 3rd century B.C. This is the last day of your holiday to the jungles of India. You can spend the day relaxing till it is time to head for the airport to board your flight back home.